BLDGBLOG: Political Buffer Space and Chinese "Black Jails"
According to the New York Times, there is, in Beijing, "a secret network of detention centers used to prevent aggrieved citizens from lodging complaints against the Chinese government." 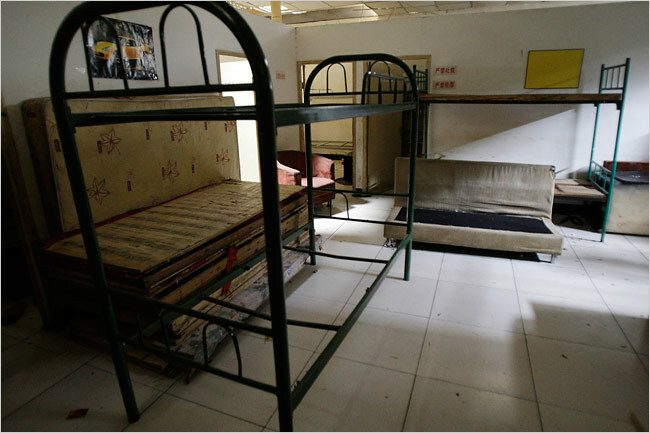 [Image: "Bunk beds are seen in a room in a black jail in Beijing in August 2009," the New York Times explains. Apparently, "more than a dozen illegal detention centers known as black jails exist in Beijing." Photo by Greg Baker for the AP]. It is part of a "Byzantine network of interceptors, guards and holding pens," the article continues, "used to put off the petitioners who flock to Beijing in the hope that the authorities will resolve longstanding grievances, many of them involving official corruption in their hometowns." Like a deleted scene—or alternate ending—from Zhang Yimou's film The Story of Qiu Ju, we read that "those grabbed off the street often have their cellphones and identification confiscated before being locked away in guesthouses or dank basements. After being held for days or weeks, inadequately fed and sometimes beaten, they are shipped back to their home provinces with the admonition that they stay away from the capital." Although the right to petition the authorities is enshrined in the Constitution, that right is frequently swallowed up by the reality of contemporary China’s system of governance: local officials, facing pressure to maintain social stability, are penalized for allowing too many complainants to find their way to the offices of the central government. This need to prevent "too many complainants" from finding their way to the center necessitates the construction and maintenance of counter-spaces—"dank basements" and other makeshift jails—as a kind of architectural buffer held up against political reform. In fact, it's more like an exact inversion of Kafka's "Great Wall of China" story, in which an imperial messenger is lost and indefinitely dislocated on a fruitless attempt to find exit from the governmental architecture all around him. 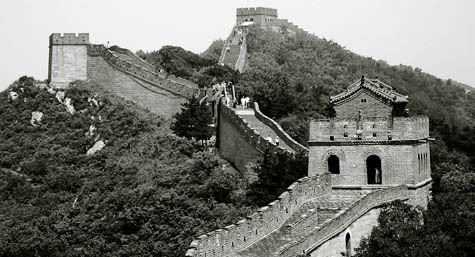 [Image: The Great Wall of China, via Wikipedia]. In that story, we see a messenger whispered something of great importance by the emperor himself; now that messenger simply has to relay his words to the proper authorities elsewhere. However, "how futile are all his efforts," Kafka writes. He is still forcing his way through the private rooms of the innermost palace—but he will never win his way through. And if he did manage that, nothing would be achieved. He would still have to fight his way down the steps, and, if he managed to do that, nothing would be achieved. He would still have to stride through the courtyards, and after the courtyards the second palace encircling the first, and, then again, through stairs and courtyards, and then, once again, a palace, and so on for thousands of years. And if he finally did burst through the outermost door—but that can never, never happen—then the royal capital city, the centre of the world, is still there in front of him, piled high and full of sediment. It is buffer space, in other words: space in the way of political communication. By comparing the incarceration of Chinese citizens to a Kafka story, however, I don't mean to diminish the very real sense of political alarm one should feel at the existence of these "black jails" in Beijing; I do mean, on the other hand, to point out how different political philosophies spatialize themselves, enlisting architecture—here, an off-the-books architecture forming unofficial spaces of detainment—as a realization of their own sovereign philosophies. That is, certain building types befit certain political philosophies—and unacknowledged prisons are a particularly alarming example of this. Geographer Trevor Paglen's work becomes especially disturbing in this regard, as he takes us through places like Camp Delta or the unregulated networks of CIA rendition, and so on. But I want to go back to the less than reassuring political message of The Story of Qiu Ju, mentioned earlier. The bulk of that film presents viewers with a self-possessed heroine who has stood up, once and for all, for her and her husband's rights in the face of locally corrupted bureaucrats; but her chain of unaddressed complaints leads her to pursue higher and higher levels of governmental authority, including physical trips outward through more and more distant urban spaces. She soon finds herself emotionally alone in a strange city she cannot navigate, tracking down officials by way of nonsensically over-formalized channels of communication. And, at the end, she seems to go nowhere. It doesn't work. She lodges her complaint—and returns home. [Image: A scene of citizenry and its government, from The Story of Qiu Ju]. But when things suddenly seem to go her way—spoiler alert—it's at exactly the wrong moment, as if she never should have started the complaint process in the first place. It's as if, the film ambiguously suggests, the very act of petitioning her government has resulted in these previously unseen layers of government coming into being, materializing out of the haze of invisible sovereignty in order to respond to her call. She brings the government into existence, in other words, by turning to it for guidance and complaint. This is a morally unconvincing position to take, especially in a nation like China—but it comes with architectural implications, and these are also relevant here. For instance, would these "black jails" and political holding-rooms need to exist, we might ask in this highly specific context, if rural petitioners would simply stop coming to the city in protest? Perhaps not—but 1) this is all the more reason for such petitioners to visit the capital in record numbers, thus forcing, through sheer spatial absurdity, political change and requiring that their grievances be heard, and 2) it says volumes about any political system if its government would hold the very people who come to it for guidance inside an addressless world of dorm rooms, "dank basements," secret detention centers, and cots, officially unrecognized except for the time it takes to overlook them. It would make for a fantastic study: how do governments spatially realize themselves? Is democracy possibility in a nation built for authoritarian control—and vice versa: can true authoritarianism ever be achieved in a space designed against these sorts of peripheral—and easily denied—incarcerations? Could we reverse-Haussmannize entire nations to make repression a spatial impossibility? This study was Foucault's project, wasn't it, to chart the spatialization of tyranny? But he also said that no matter how effective a work of architecture might be as an instrument of oppression or liberation, space in itself neither guarantees nor eliminates the possibility of resistance. Liberty is a practise; which is why true authoritarianism can never be achieved (or denied) by spatial or structural means. Seems from the recently released University of East Anglia emails that skeptics of anthropogenic global warming have been given a perhaps less spatial, but no less tortuous architecture to navigate. Believers, funded and empowered by their own kind, maintain their assertion of a consensus in the peer reviewed literature by building an ideologial "buffer space" around the peer review process itself. this question of freedom, rights/architecture is very interesting & could be linked to the one of identity/emigration, exil; ie how do you keep the integrity of your identity when you have no stable referential and protective space anymore. An architectural structure can improve a democratic situation but is not its condition: take one single room with one door and one window: it can be perceived as a shelter, a home or as a prison: the difference is the use: how you activate the structure. Architecture is therefore not only the expression of a social system but also the concretization, materialization of political strategies . “PETITION – The court of the complainants”, directed by Zhao Liang. I took him about 10 years to do this documentary, at his own life risks. It is incredible. And revolting.